Since I started participating in the Zelda community in 2004, a common criticism I’ve heard against Ocarina of Time–and it does usually take on the tone of criticism–is that it is A Link to the Past in 3D. In my experience, it’s generally older fans making this claim, but regardless, it’s been there for a while now. However pervasive this particular claim is, it does lend itself to some discussion about how Zelda games transitioned into 3D, and where the franchise stands now. Superficially, the games are similar. Both games use a dual-world mechanic and both follow a similar structure–three introductory dungeons in the “light world,” and a more thorough game in the “dark world.” The meat of the entire game is in these dark worlds, actually, and the story bears this out, with Ganon/Ganondorf ruling the darker realms. Notably, both games offer freedom which has long since left the series–you can play the dungeons and progress through the overworld out of order. But the similarities, numerous as they may seem, end there. A Link to the Past is, at its core, much like the first game in the franchise. That means it’s an action game with few environmental puzzles, tight overworld design, and a constant focus on acquisition and management of items. The story is rudimentary at best, and while the presentation is good, it mostly lacks distinct characters or rich lore. Most of all, there’s an ever-present feeling of danger, propelled by difficult gameplay. Ocarina of Time looks and feels entirely different. It plays differently, too, probably as a consequence of its status as the first 3D Zelda game. 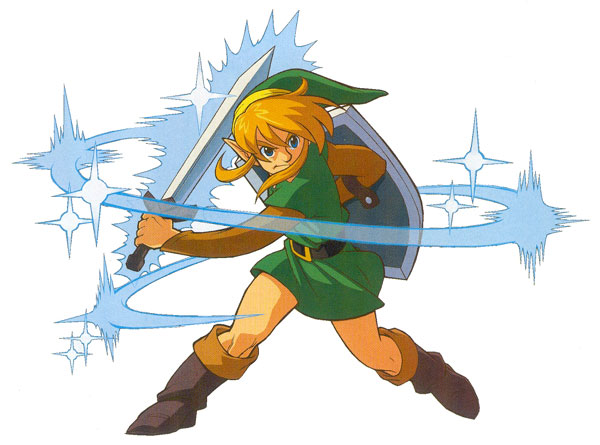 There are few enemies populating the overworld and even the dungeons; each fight is more of an event than individual fights in A Link to the Past, complete with battle music. Most importantly, dungeons are entirely different. While it was possible to get lost in A Link to the Past’s dungeons, it offered nothing remotely resembling The Water Temple. Ocarina of Time bought environmental puzzles to the fore, and it wasn’t about the “big questions” like how to access half the map–it was about finding your way out of each room. There is also much more of a focus on getting to each of the individual dungeons; each one is preceded by increasingly lengthy, linear quests specific to each part of the overworld. This makes the path to each dungeon less integrated (it’s less likely you’ll obliviously stumble upon a dungeon), but more developed. Ocarina of Time’s contribution to the series’ lore is much more significant. A Link to the Past presented us with decent backstory, but without characters or thorough sidequests, mostly felt like the empty world of a video game. This doesn’t necessarily make it worse, just more streamlined, more suited to the action focus. Ocarina of Time, with its exploration focus, offered us new races, each with their own unique histories. Like A Link to the Past, every location had a backstory, as well–but here, it was more thoroughly developed and hinted at through the characters. If anything, Ocarina of Time felt more like a spiritual successor to its immediate predecessor, Link’s Awakening. 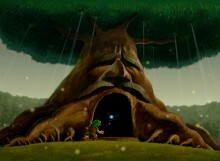 That game offered Ocarina songs, a more user-friendly experience, and individual characters who played a role in the story at large. It also placed a focus on poignant subplots, and ironically also more fully developed signature Zelda humor. This same tone was carried over to Ocarina of Time and even Majora’s Mask. The dual-world mechanic and structure aren’t enough to make Ocarina of Time a clone of A Link to the Past. The dual-world mechanic is far more developed and pervasive in A Link to the Past, with constant switching between worlds, and as far as structure is concerned, it doesn’t always have much impact on the specifics of any gameplay moments. Ocarina of Time would not have been possible without either of its predecessors, but it certainly has a place as a further development of existing themes and gameplay ideas. The influence is there, but it’s often overstated. While it adheres to the Zelda formula which A Link to the Past pioneered, it is not a stagnant moment in time. Its 3D gameplay necessitated an entirely different approach. Once again, I should stress that none of this makes one game any better than another. What it does is showcase how Nintendo developed specific ideas and adapted them to a handheld or 3D space. It also acts as a refutation against a more common criticism of the franchise as a whole, that each game is simply a “rehash.” Zelda games have their own ideas, they simply use structural similarities as platforms for those ideas. That’s how it should be–what would a Zelda game be without a common thread or gameplay mechanic to tie it to the others? Even if you’re not familiar with the argument I’ve tackled here, I encourage you to participate in the discussion. How similar are Ocarina of Time and A Link to the Past, really? How similar are other games? Is the pervasiveness of the Zelda formula overstated?